I have worked with thousands of couples throughout the years. I have seen and heard it all. But when it comes down to relationships and marriages ending, there are really 5 basic reasons that exist. 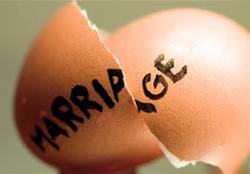 And while some marriages are better off coming to a close, most marriages could have been saved if the couple had only been able to shift these 5 things. Please share this information with others. It just might save their marriage. You and/or your spouse need to win or be right. I can’t tell you how destructive this is to a marriage. It is far better to seek understanding rather than focusing all your energy on being right. We’ve all heard “It is better to be happy than to be right.” But most couples continue to dig deeper holes during arguments. Learn how to approach conflict differently. Once you learn how to deal with conflict effectively, you will find yourself feeling satisfied and connected, not frustrated and angry. You and/or your spouse spend significant time soliciting agreement from friends and family on making the other spouse “the bad guy.” Friends and family will typically support you and your take on how things went down. The more you get agreement from others, the less likely you are to look at things from another perspective and take responsibility for your own actions and feelings. You are destined to become the victim; and unfortunately, this may also mean a victim of divorce. You and/or your spouse are committed to finding evidence that the other is and will continue to hurt, betray, disappoint, and abandon you. When you have decided that your spouse is ____________ (fill in the blank), you may become too attached to making this true. When this happens, you will look to the past, present, and future and will inevitable find evidence for why this is so. You will skew history, distort the present, and see only what you want to see. In these cases, you truly are committed to a failed marriage. You and/or your spouse express contempt. This can take many forms. It can be an overtly nasty comment, a lack of responsiveness altogether, or a passive-aggressive behavior such as neglecting responsibilities. When you begin to deal with marital problems in this way, you immediately give the message that the marriage and your spouse hold little regard. This quickly causes irreparable damage. Too much contempt over a long period of time may be cause for divorce. Staying in a contemptuous marriage too long eats away at the soul of everyone involved. Change the behaviors or get out. You and/or your spouse engage in outside activities that destroy trust and workability. These activities include extra-marital affairs, addictions, and keeping other serious secrets. A healthy marriage is all about openness, honesty, and trust. When this is broken in a significant way, it takes a long time with consistent sustained effort to rebuild that trust. Yes, it can be done. However, if these activities continue to show up time and time again, the marriage will always be broken and empty, even if you decide to stay together. Furthermore, you can count on a lot of pain to carry you through the years.